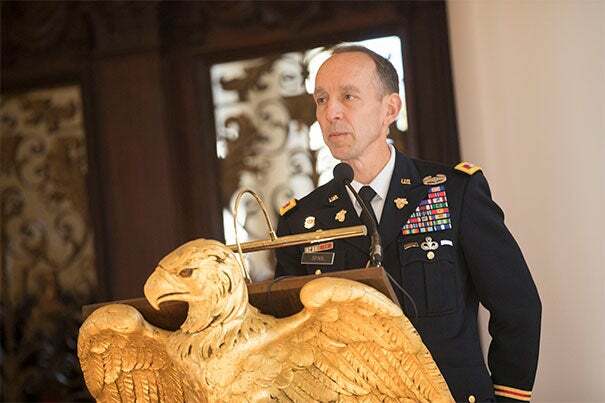 During the Veterans Day ceremony at the Memorial Church on Saturday, U.S. Army veteran Thomas Reardon '68 announced Harvard's partnership with the Service to School's VetLink program. Eighty-five years ago, Memorial Church was dedicated in Harvard Yard. On Veterans Day, Harvard’s military community returned to the church to honor service members past and present. The 11 a.m. ceremony marked a number of milestones: One was a rededication of the original Memorial Church bell, which tolled Saturday in memory of Harvard veterans. The second was the dedication of a plaque honoring Harvard’s Four Chaplains for their heroic sacrifice aboard the U.S.A.T. Dorchester in February 1943. Finally, the service included an announcement, by Thomas Reardon ’68, director of the Harvard Veterans Alumni Organization, and Army Col. Everett Spain, that Harvard College has joined Service to School’s VetLink program for a preliminary period of three years. 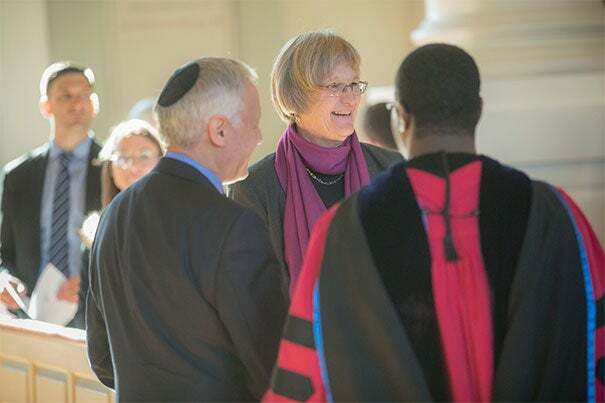 As noted on Saturday, the VetLink partnership continues Faust’s record of strengthening the military presence at Harvard, including her support for ROTC, which returned to campus in 2011. Her efforts to admit more veterans as undergraduates were also praised. In recent years, Harvard College has been successful in expanding outreach to various segments of the college-bound population — normally secondary school students — who are interested in military service. With this new partnership, the College is broadening that focus to identify highly qualified veteran applicants. Through the VetLink program, these applicants are afforded an enhanced opportunity to showcase their military service, and Harvard gains powerful tools to improve its outreach efforts to veterans who could flourish at the College. Funding for the VetLink partnership is being generously provided by Reardon and fellow Vietnam veteran Bruns Grayson ’74, both of the Harvard Veterans Alumni Organization, which seeks to promote connections among veterans on campus and in the alumni community and to raise awareness of Harvard’s tradition of military service. Service to School is a nonprofit that provides application counseling to veterans. Among the organization’s goals is to help veterans win admission to top universities, part of a larger effort to ensure that today’s education benefits for veterans are as effective and as transformative as they were for veterans of World War II. In addition to Harvard, VetLink members include Amherst College, Cornell University, the University of Chicago, Massachusetts Institute of Technology, the University of Notre Dame, Pomona College, Princeton University, Smith College, Stanford University, Smith College, Williams College, and Yale University. The Four Chaplains honored for their bravery in World War II were Lieutenants George L. Fox (Methodist), Alexander Goode (Jewish), John P. Washington (Roman Catholic), and Clark V. Poling (Dutch Reformed). After arriving at Harvard’s Army Chaplains School in 1942, the four “occupied the same pews we’re sitting in now,” said Jonathan L. Walton, Plummer Professor of Christian Morals and Pusey Minister in the Memorial Church, at the Saturday service. En route to a post in Greenland, the U.S.A.T. Dorchester was hit by a German torpedo. Realizing they had barely a half-hour to live, the chaplains worked together to save their fellow soldiers, even sacrificing their own life preservers. A survivor would remember them linking arms and looking skyward as the ship went down, praying in Latin, Hebrew, and English. The morning’s keynote speaker, Rabbi Arnold E. Resnicoff, a retired Navy chaplain, reflected on the legacy and present-day resonance of the valor shown by Fox, Goode, Washington, and Poling. The Big 6, a cover band formed at the Harvard Humanitarian Initiative, is planning a concert to aid communities recovering from Hurricanes Harvey, Irene, and Maria.